Dalhousie University will soon be home to its 36th member of the Royal Society of Canada – Andrew Roger, a professor and the director of the Centre for Comparative Genomics and Evolutionary Bioinformatics. Roger, who supervises a lab of graduate students and postdoctoral researchers in Dalhousie’s Tupper medical building, is quick to attribute his success to a collaborative effort. “In a way the RSC is an award that I would like to share with the excellent people who have been a part of my team,” Roger said. The research done in Roger’s lab addresses basic evolutionary questions about the pattern behind, and processes driving, the diversification of life: where did life come from, and how did it evolve on our planet? All living organisms are conventionally divided up into three groups, or domains. Bacteria and archaea refer to microscopic single-celled organisms that lack a cell nucleus, while eukaryotes encompass everything else, including humans. Roger’s team is concerned with one-celled eukaryotes. It is known that they originally evolved from bacteria and archaea (prokaryotes), and Roger’s lab aims to find out what events took place billions of years ago in order to make this diversification of organisms possible. “Clarifying the early history of how life evolved is realizing a dream had by many biologists since Darwin first proposed that evolution was responsible for the myriad of different life forms on earth,” Roger said. 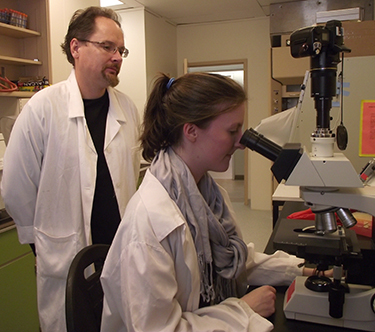 Courtney Stairs, a doctoral student in Roger’s lab, described him as an excellent supervisor. She is one of about a dozen researchers in the lab. Microscopes, incubators and pipettes can be seen from almost any vantage point. Roger says students like Stairs and their specific research projects are the greatest pleasure of his job. He always learns a lot from discussions with the students, he says, and he enjoys the opportunity to help great students advance their research careers. The Royal Society of Canada was given a charter in 1883 outlining its mission to promote learning and intellectual accomplishments of exceptional quality. Fellows from any subject are considered top intellectuals and significant contributors to the development and furthering of research in Canada. Roger ‘s Dalhousie colleague John Cullen from the department of oceanography is also becoming a fellow of the society this year. This is the second year in a row Dalhousie has had a pair of inductees. They will be made fellows during a Nov. 17 ceremony in Ottawa. “The award reassures me that there is still an institution that values achievements in basic curiosity-driven scientific research in Canada.” Roger said. He noted that the federal government is placing pressure on grant agencies to fund research that is explicitly connected to industry and economic development. As a result, the role of the society and its interest in “curiosity-driven” research such as Roger’s is more important than ever. Fellows can add FRSC to their titles, helping achieve the recognition often needed to get funding. The tree of life is a scientific effort to classify all living organisms as a function of previous common ancestors. Within the three domains mentioned in the article exist subgroups – kingdoms, phyla, classes, orders. Roger’s lab deals exclusively with microscopic organisms in the domain of eukaryotes. By studying the DNA of the organisms, researchers are able to see how closely one is related to any other. This is important information when trying to place all organisms on a family tree. One of Roger’s greatest achievements is gathering the evidence for a new kingdom within eukaryotes called excavata. The genetic sequencing done by the lab was able to conclude that these organisms belonged in a class of their own.